Bhajans & Hymns on Lord Dattatreya by His Holiness Sri Ganapati Sachchidananda Swamiji. Performing Kakada Arati is a tradition followed by the devotees of lord Dattatreya. It is a practice characterized by performing Arati with 16 lamps. The number 16 signifies completeness. The most prominent incarnations of Lord Dattatreya are also sixteen in number. Kakada Arati is a worship performed at the end of the day wherein Arati is performed to Lord Dattatreya with 16 lamps. Parama Pujya Sri Ganapati Sachchidananda Swamiji verily the incarnation of Lord Dattatreya has been reviving the sacred Dattatreya tradition Sri Swamiji has successfully revived the Kakada Arati tradition and has composed seven Bhajans corresponding to the seven days of the week. This album contains all the 7 compositions along with the popular Datta Stava composed by Swami Vasudevanada Saraswati and the rare Sri Dattatreya Vajra Kavacham from the sacred treatise Rudrayamala Tantra. It’s panacea for those who are affected by serious aliments. 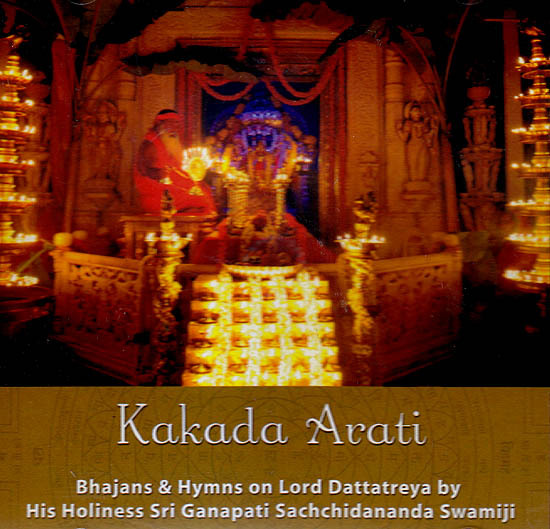 We are immensely pleased to present this album in which Pujya Sri Swamiji has rendered the Bhajans and hymns in praise of Lord Dattatreya in a style unique to him.